Boasting advances in image quality and trigger speed, this workhorse of theM-Series line just keeps getting better. 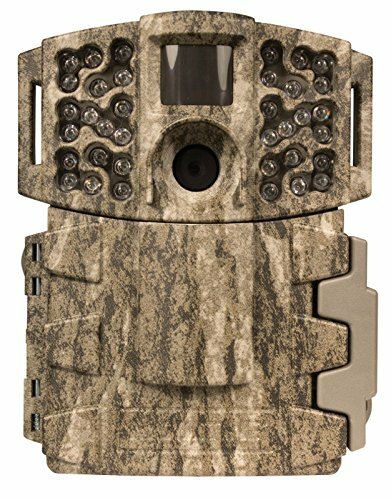 A high-performance 14-megapixelsensor captures crisp daylight images, and with the M-888’s long-range,100-foot infrared LED flash, you’ll be sure to catch that elusive buck oncamera at night. Better yet, an ultra-simple Quick Start menu makes camerasetup a breeze while enhanced compression technology means you’ll enjoy up to2.5 times more image storage! A Mossy Oak Bottomland camo case completes thepackage and helps keep the camera hidden in the woods. INFRARED FLASH: A flashequipped with 36 LEDs and 850 nm nighttime infrared technology illuminatesgame up to 100 feet away in total darkness—for maximum coverage with minimalintrusion. PHOTO & VIDEO RESOLUTION: Manage image quality and storage with 4resolution settings, from low (1280x720px) to enhanced (3840x2160px), andcapture video in 16:9 (HD) aspect ratio. SPECIAL FEATURES: Multi-shot, time-lapse and hybrid modes (triggered by passive infrared and time lapse) offerhunters total versatility and customizability while reduced motion blur andextended flash range enhance nighttime image clarity. EXTERIOR: A sturdy casewith a weatherproof plastic exterior comes with standard 1/4"-20 bottom tripodmounts and back slots for use with an included nylon strap or Python lockcable (sold separately) for tree mounting. A Python lock-compatible claspoffers added security. MEMORY CARD COMPATIBILITY: Works with SD/SDHC Class 4cards or higher and can handle up to 32 GB. Memory cards sold separately.MANAGED MEMORY: If set to “Overwrite Oldest,â€ the M-888 will erase your oldestphotos and videos to free up space for new photos and videos when your memorycard reaches full capacity. BATTERY LIFE: Requires 8 AA batteries. Capturesapproximately 17,000 images. Actual results may vary. OTHER POWER SOURCES:Compatible with any Moultrie 12V DC external power source. Camera alsosupports AC power mode.